The government has already paid more than £20m in one-off redundancy payments as part of the abolition of hundreds of quangos, the BBC has found. A request under the Freedom of Information Act revealed almost 1,000 redundancies so far from 29 of the 481 public bodies being wound down. The Crown Prosecution Service paid a single recipient £200,000 in one case. The government, which aims to save £1bn a year from the closures from 2014, said it was pleased with progress. It has announced that 192 quangos - which stands for quasi-autonomous non-governmental organisations - will be abolished and a further 289 changed by merging them with other groups. Ministers said the move would improve local accountability as well as cut costs, but Labour claimed it could end up costing more than it saved. BBC business correspondent Joe Lynam said the final cost of the process - dubbed the "bonfire of the quangos" - remains unknown. 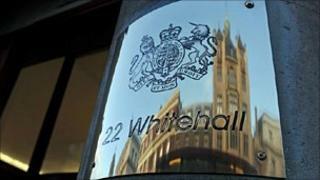 The bodies, such as the Film Council and Audit Commission, are funded by Whitehall departments but not run by them. They are advisory bodies, consumer watchdogs or organisations carrying out public services. A spokesperson for the Department for Business, which is responsible for closing some quangos, said the process was being carried out in a way that protected taxpayers' interests and provided value for money.